A new report by the Catholic Research Forum (an initiative of the Benedict XVI centre at St Mary’s University, Twickenham) has something to tell us about evangelisation. 7.7 per cent of the 3.8 million Catholics in the UK are ‘converts’ – I put the word in inverted commas because the report tells us that 99 per cent of them were raised in another Christian communion. In other words, a tiny number of new Catholics have truly converted to Christianity and received Baptism, Confirmation and the Eucharist. The Catholic Church in the UK then, is receiving people many of whom have already received a basic understanding of the Christian Faith (and baptism). My own guess is that a high proportion will be those who devoutly and prayerfully have been trying to live the Catholic life in the Church of England and who now seek its fullness in the full Communion of the Catholic Church. But the ‘pool’ of this group within the Anglican and other Christian bodies is rapidly decreasing: how then does the Catholic Church do primary evangelism? How does it proclaim the Faith of Jesus Christ as Saviour, Redeemer and Lord, to those who do not believe in God? How are they converted to Christ, and how are they nurtured and taught into the Faith so that they persevere in Christian living for the rest of their lives? We still behave as if the principal way of passing on the Faith were within the family, from parents to children, and the chief means of knowing the faith was within the context of the Catholic school. No doubt this remained true for Catholics well into the 20th century. I doubt whether it is still the case. Where other Christian denominations are successful in bringing unbelievers to faith in Jesus Christ, it is through friendship evangelism. In the 1980’s I asked a random group of (Anglican) faithful how they had become Church members. Only one of the group of 20 people had been brought up in the Faith by their parents: the other 19 had been influenced by a friend in their teens or early adulthood. Time and again one has seen the personal witness of belief and Christian living of a friend has initiated the process of conversion. It is rarely the clergy who have this influence; nearly always it is a lay friend. And it is this lay friend who accompanies on the journey to conversion – and beyond! For the seeker, as for the convert – and for the new Catholic – this journey can be very lonely. How do they find their way into the average Catholic parish?The size of congregations at Mass make personal contact difficult, as does the ratio of laity to their priest. Although large congregations (of the Catholic size) are rare among Anglicans there are some – and it is worth considering how they nurture and encourage those who are new to the Faith. It is not the Sunday congregation gathered for worship which does this, but the small (home) group. Led by a lay person, the group is small enough (15 – 39 people) for everyone to matter. There is time for teaching, as there never is at Sunday Mass; time too, for those questions and for the sharing of the experience of other Christians to be heard; above all, for the new person to become quickly part of group where they are respected, noticed and cared about: where they find someone they know to sit with in the Sunday congregation of 500! 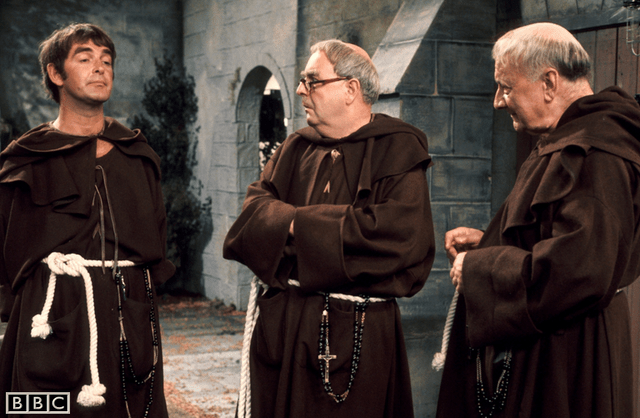 Is it fair to say that the policy of the Catholic Church in the UK seems to be largely centred on provision of Masses and the other sacraments, against the background of the falling numbers of priests? This policy has resulted in the closure of churches and the amalgamation of parishes. The bishops rightly want to protect their priests from burn-out caused by an impossible work-load. The (very) faithful will get into their cars to drive five miles to Mass, where once they walked down the road. But the seeker will not. And the new Catholic, missing the closeness of his or her RCIA group, will feel isolated and lonely with only Saturday Mass as the weekly contact (or lack of it) with the family he understood he was joining. There are problems with lay leadership of groups, whether they be home groups or small parishes where there is no resident priest. Quite simply, lay leaders have not been accountable to the Bishop as the clergy are, for their teaching and life-style. There is a fear that their very closeness to the world will blunt their witness to Catholic truth, which will lead their groups inevitably to secular liberalism. But it was not so in the early Church where the laity were often most stubborn in their orthodoxy, nor is it so in the Evangelical churches today. What is needed it clergy who can teach and inspire their lay leaders. The Catholic Church spends many years and much money forming its clergy. One of the prime aims of this formation is to enable them to communicate the Gospel to others. They are not there simply to provide Masses so that they faithful can fulfil their obligation! It’s a two way process: the Catholic laity have to grasp their responsibility as primary evangelists, as friends of those who are on the Way, for they are the way in which other people will see Jesus, come to know hom and enter into his Church. The clergy have to encourage, teach and resource the Catholic laity for their task. And to do it with enthusiasm, confidence and joy. Last Sunday, the third Sunday of Eastertide, the Bishop of Amiens celebrated Mass in the parish at St Peter’s, Pont Remy. It was a very happy occasion for us, and the people had worked hard getting everything ready. The chorale had chosen well known hymns (even I knew them, which is a good test) and rehearsed on Saturday afternoon. With the singers from both Long and Pont Remy they made a joyful sound. 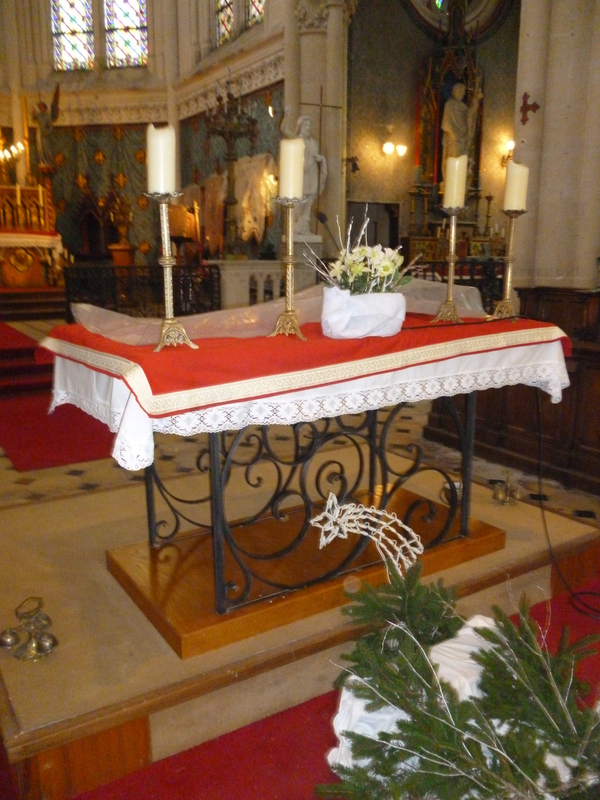 The sanctuary at Pont Remy had been enriched with some splendid red curtains (the fabric a present from our kind parish in Germany) and a re-furbished Paschal candlestick found in the sacristy at Long. Monseigneur Olivier Leborgne has just celebrated two years as Bishop of Amiens. This is not an easy diocese, and he made it clear in his homily that increasing the number of priests is key to the renewal of Christian life in France. This is in no way to devalue the vocation of the laity: indeed, next Sunday we hold a major consultation to set up our ‘Equipe de Conduite Pastorale’, through which the lay people exercise key roles in the witness and ministry of each parish. In the Ordinariate such a team or council is obligatory – part of our Anglican Patrimony – and it will be a great relief to me to have such a team to work with. 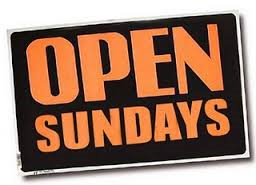 But open churches, kept clean and tidy, with the Blessed Sacrament reserved wherever possible, within which is celebrated worship as good as we can make it – often moves people and kindles their interest. The fact that we have neither pots of money nor large numbers of people is no excuse for not doing the very best we can. 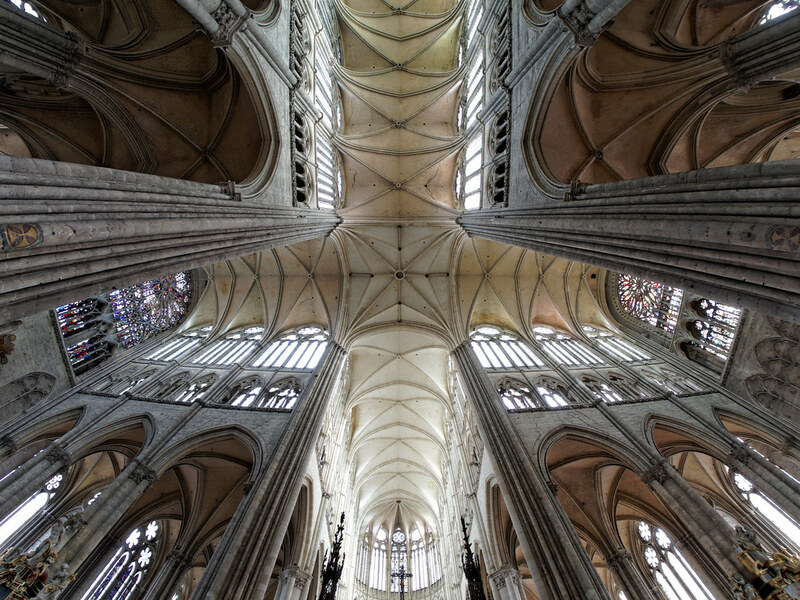 It is part of our Anglican heritage, I think, to have a concern for the beauty of worship and the care of the buildings in which the liturgy is performed. This can sometimes lead to too much time being spent on buildings and in the sacristy. But obsessive fussiness about points of liturgy in some clergy and lay people does not excuse careless or sloppy worship. I have made the point before that the absence of minute details from the rubrics of the Mass since 1970 means that priests (and servers and other ministers) have to have much better liturgical education. It is not much use knowing when the seventh candle should be used on the altar (we didn’t use it, by the way) if you are constantly distracting the people during the readings by fiddling with the thurible! (Yes, I have seen it – too often). But in the end it will be the beauty of the lives of ordinary Christian people lived in service, their voices raised in worship, filled with the love of Jesus the Son of God, and in the power of the Holy Spirit, which will draw and convert others. It seems to me to be one of the key roles of the priest to inspire his people in their mission, to deepen their worship and prayer, to teach and help them to grow in understanding of the Christian Faith, and to develop with them effective skills for sharing and commending this Faith to others. It was good to have the Bishop with us. I think it was Mother Theresa SSM, when she was at Haggerston Priory, who wrote that it was difficult to find time both to do the work and to find time to write about it. However, I have been persuaded by David Murphy that I should try to write a few lines about the celebrations of Holy Week in the parish. David was very generous with his time, coming over from Germany to stay the week. It was made particularly difficult for him as he fell and broke his arm just weeks before coming. His son Alexander stepped into the breech and did all the driving, and I am enormously grateful to him as well. Holy Week began with the celebration of Palm Sunday – ‘Rameaux’ in French. Here was my first surprise. I arrived at the village of Long for the Saturday evening Mass to find that the congregation, normally 15- 20 had more than tripled. We were in the main church again! There is no tradition of ‘palm crosses’ and the people had come with huge amounts of box hedge which after Mass they distributed to friends and family. The Sunday morning Mass at Pont Remy saw substantial growth too, and the children of the Catechism had made long red streamers to wave in the Procession: some reticence about going outside, so we started at the main door. 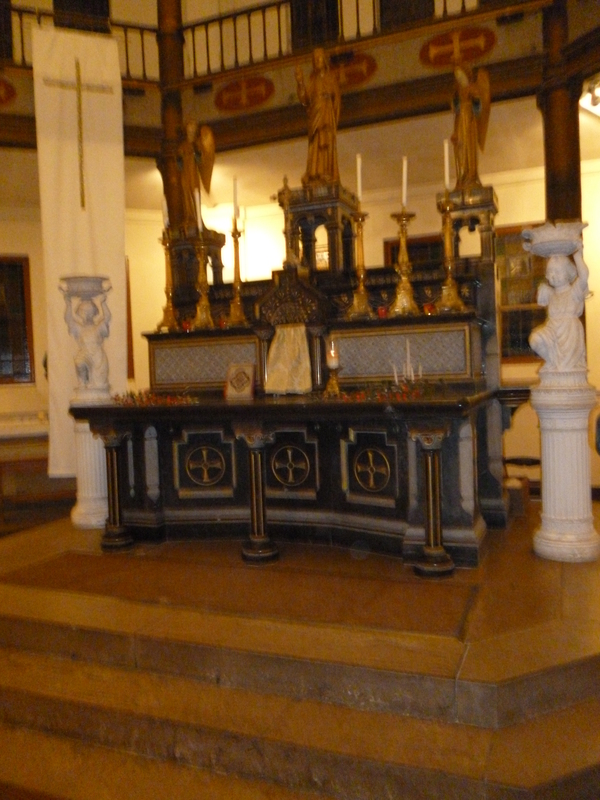 The week before at Pont Remy the men had moved the Lady Altar which was hidden behind the pulpit to a more prominent site in the south aisle and on Monday we began to prepare it as the place of repose for Maundy Thursday night. Monday evening Mass was at Francières, Tuesday at the Cathedral for the Chrism Mass, and Wednesday evening at Cocquerel. Maundy Thursday evening we kept at Pont Remy, and I was privileged and moved to wash the feet of six parishioners; and also to concelebrate the Mass with Fr Jean-Francois Lefebvre, a religious who was visiting his mother in hospital. At the end of Mass we took the Blessed Sacrament to the beautifully decorated place of repose, and kept watch for an hour. it is worth saying that during the previous two weeks members of the congregation had delivered to every house in the parish (nine villages and a couple of hamlets) the ‘Journal’. We had produced a photocopied sheet for Christmas, but the team had developed the idea and the Easter Journal was in full colour and four pages. The Vigil on Holy Saturday night has been traditionally celebrated at Long. It is quite a setting for it. The church was totally rebuilt in the 19th century when Long was one of the wealthiest communes in France, based in the sale of peat cut from enormous reserves in the Somme valley. A full team of servers were gathered in the sacristy; we had discovered two fine Paschal candlesticks, and cleaned and renovated them for Long and Pont Remy; the gold vestments were a present from my 59 Club friend Fr Dennis McSwiney, priest of Northampton diocese who died last year. Seventy people gathered on the steps high above the valley, as the fire was blessed and the candle carried into church. I managed to sing (with quite a few mistakes, I think) the Exsultet in French, and the chorale led the psalms of the Vigil and the Mass. We had brought the font back into use, and water was blessed for the Baptism which was to take place on Easter Day. By the time we had finished the Liturgy the heavens had opened, the rain poured down, but the enthusiasm of the people was undampened. ‘Une belle messe’ was said again and again as we greeted each other at the door. And I heard the same for the Mass of Easter Day at Pont Remy. Lots of people, the chorale singing with care and enthusiasm, white and gold flowers, the refurbished shrine of Notre Dame des Etangs, renewal of baptism promises, sprinkling … then back to Long for the baptism. Even so, Easter was not over. Traditionally, Mass is celebrated on Easter Monday in the tiny chapel at Longuet, in honour of St Julien the Hospitaller. Seventy people squeezed in on the ancient benches, a fascinating mix of music with one of the youngsters on a keyboard for the hymns – and Missa de Angelis for the Mass! Quite a week – Holy Week & Easter in English is quite a lot to do; for me doing it for the first time in French was pretty tiring. But wonderful! And the people responded magnificently. It should not surprise me – but often does – that the celebration of Easter should be so significant for renewal. Perhaps when we’ve calmed down I’ll try to think a bit more about that – and to do a post before another six months is up. Last Sunday in the parish of Notre Dame des Etangs in northern France saw the return of the Catechism for a new year. Under the 1905 separation of Church and State in this country, religious teaching was excluded from the school curriculum but schools were closed on Wednesdays so that children might attend their Catechism classes. For five years children attend a weekly or fortnightly class, as they prepare for First Confession, then First Communion, and finally something called ‘Profession of Faith’ (which is not Confirmation, which follows during teenage years). In recent years the numbers for Catechism have dropped off dramatically. One priest told me that when he was first ordained fifty years ago nearly half the children in France were in a Catechism class. 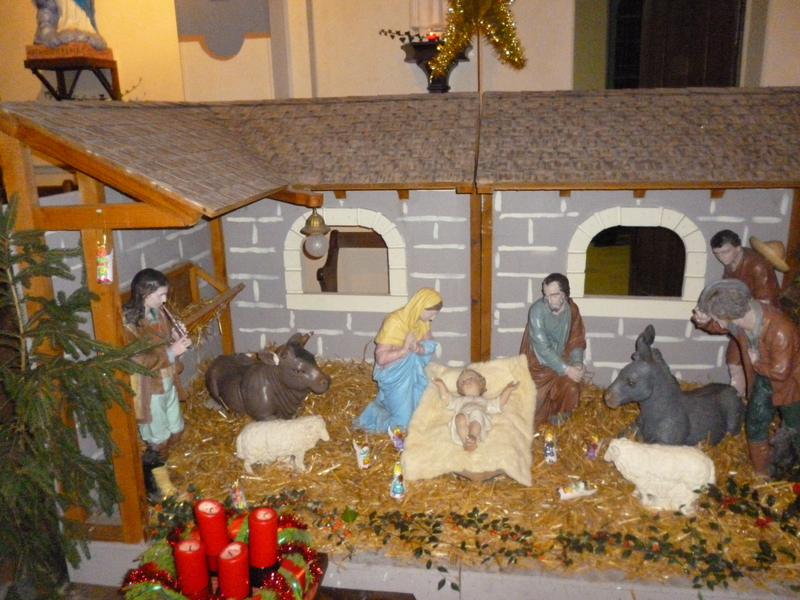 In a parish like ours the numbers are very small, and often neither parents nor children come regularly to Sunday Mass. In my first few weeks in the parish I have had the opportunity to talk and work with three enthusiastic teachers and with some of the children. The Catechism books are beautifully produced, and later on I did some practical work with them, preparing for the celebration of All Saints’ Day – a public holiday in France, though this year it falls on a Sunday. For some families – maybe an increasing number – the Catechism is part of the ‘Rite of Passage’. The children are baptised and make their first Communion. Then they lapse completely, not even making it to Confirmation. Indeed, I do wonder if Confirmation has become here the Sacrament without a reason. Would it be better to replace the ‘Profession de Foi’ with Confirmation, and to reverse the curious progression which has prevailed since the time of Pope St Pius X, of baptism, first Communion – and then Confirmation? Already I sense that the Catholic Church in France – in spite of separation of Church and State – has some of the same problems with ‘establishment’ as does the Church of England. In an attempt to appear warm and welcoming, the Church is fearful of challenging – and becomes perhaps too accommodating. As someone is once supposed to have said of the C of E. “The Church of England is what the people of England want her to be.” But this Sunday’s Gospel (the Rich Young Man) reminds us that Jesus makes demands on people (on us) and demands nothing less than our all. Yes he does so as one who lives by his own demands, giving all for the world. Somehow when Jesus calls us to give our all, what comes over is his utter love for us. How often this is in contrast to the ‘rules’ of the Church which seem to be nagging and narrow. Or would people nowadays have perceived Jesus like that? As young Muslims respond with vigour to the practise of their faith, perhaps it is time for us Christians to throw off comfortable and undemanding religion and to embrace a renewed Christianity where the Saviour in his love makes powerful, and sometimes painful, demands over our lives. 18th century funerals conducted in the latest historical drama on the TV by a clergyman in a lacy surplice and green chasuble – but does it matter? Not as much as when a popular series deliberately alters the facts in order to question the confidentiality of the confessional, and to attack the Catholic opposition to abortion. Surely not? 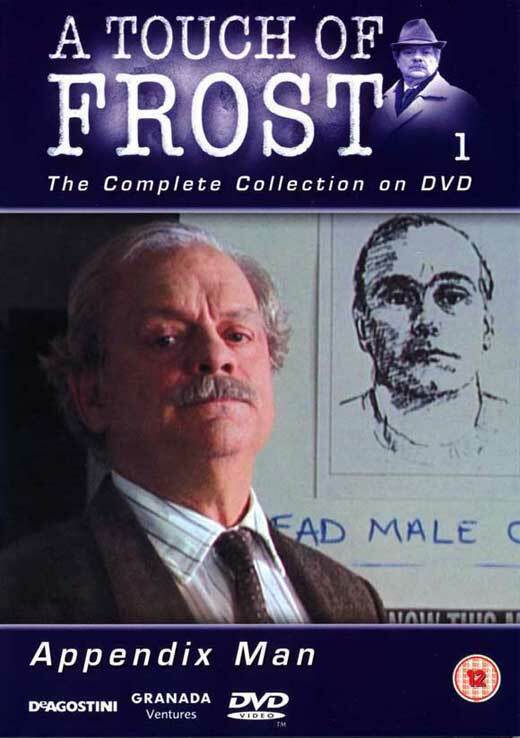 I have been watching again on DVD the “A Touch of Frost” series with Inspector Frost played by David Jason, and made between 1992 – 2010 . A horrific murder is apparently discovered by a Catholic priest. Jack Frost visits him late evening at his church (actually the magnificent Anglican Church of St Wilfrid Harrogate). 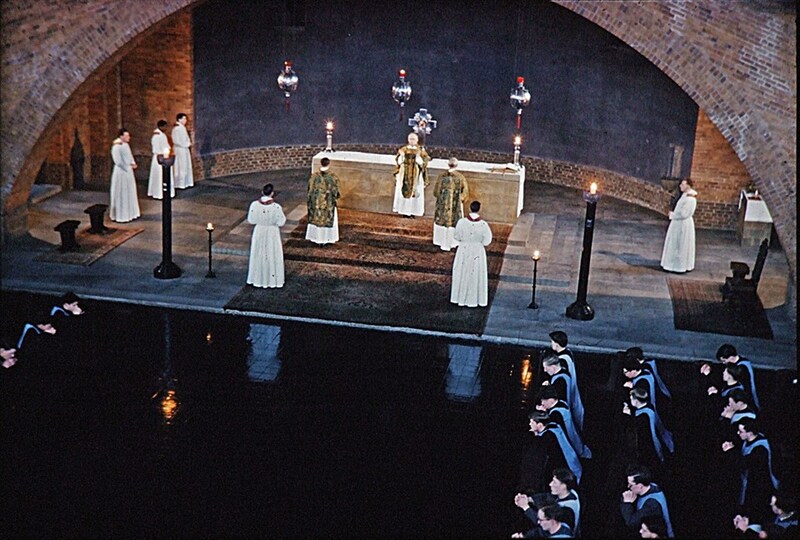 The priest (in cassock – not usual for Catholic priests in England) is praying before the Lady Altar (where all the candles are alight, including the standards from the funeral catafalque – thank you, Harry, for your last comment !!!) Frost has discovered that the murdered woman had been ‘excommunicated’ after having an abortion. The priest admits that he went to the Bishop after hearing her confession because he had no choice! Now the confidentiality of the confessional is absolute, and any priest telling anyone (bishop included) what he had heard there would himself be excommunicate. But Frost ploughs on: the woman had a condition which made it dangerous for her to conceive – the implication being that the Church’s teaching on abortion is itself wrong. What is passed over in the story-line is that the woman concerned had become pregnant after an affair with a another character, which she then broke off. Lastly, and very oddly, the ‘excommunication’ is not known by the women’s sister, with whom she presumably went regularly to Mass. So her sister never wondered why she was no longer going to communion? More likely, I think, that the author/producer/director had no real idea what excommunication means! But three points are insinuated into the minds of the ordinary viewer. (1) that Catholic position on abortion is cruel, inflexible, and incomprehensible (2) that it is quite reasonable to resort to abortion over a ‘mistake’ for which I may disclaim all responsibility (3) that the ‘secrecy’ of the confessional has more to do with the power of priests (celibate, of course, and unable to understand ‘ordinary’ people and their lives) and does not serve ‘justice’. I.e. priests ought to be ‘forced’ to tell what they have heard when the police/parliament/courts require it! A position which the current Home Secretary comes close to endorsing from time to time. And after all, these views are being expressed by the decent, honest, down-to-earth copper who is Inspector Jack Frost. Period drama nowadays goes to extreme lengths to ensure accuracy. In every area, that is, save the ecclesiastical. There, I’m afraid, one is still likely to see a scene from a Jane Austen novel with the clergyman conducting a funeral wearing a green chasuble over a lace-trimmed surplice! Such inaccuracy is born of two things: first, that the producer (probably middle-aged and with some vague memory of his public school religion) thinks he knows what is and what is not; and secondly, that he doesn’t really care because its only ‘religion’ and no-one else will make a fuss any way. So we are back (for the ‘religious’ scenes anyway) with the 1950 films of Robin Hood, with the hero in green crimplene, and the heroine with bouffant hair-do and too much lipstick! In the late 80’s I was for a few weeks unofficial (and unpaid) adviser to a film company making a film in Docklands. 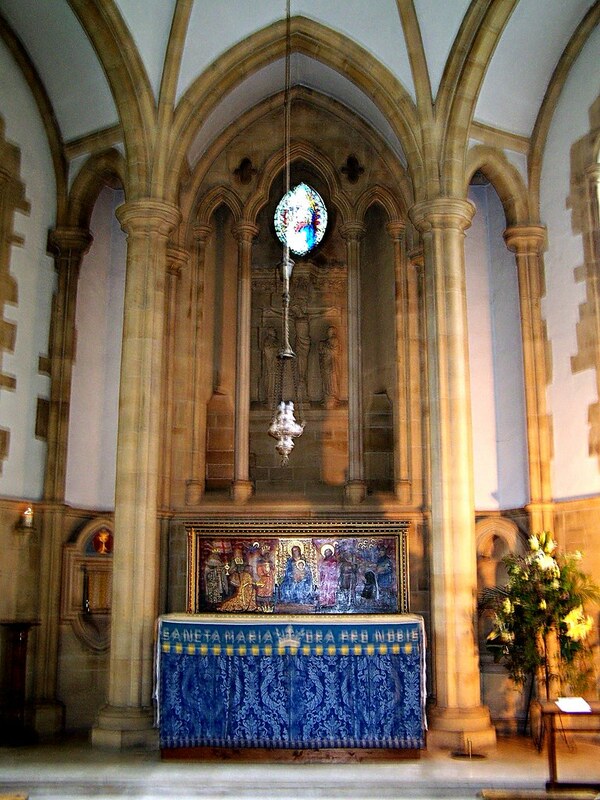 I helped them gather together the furnishings to create the sets within a redundant church. 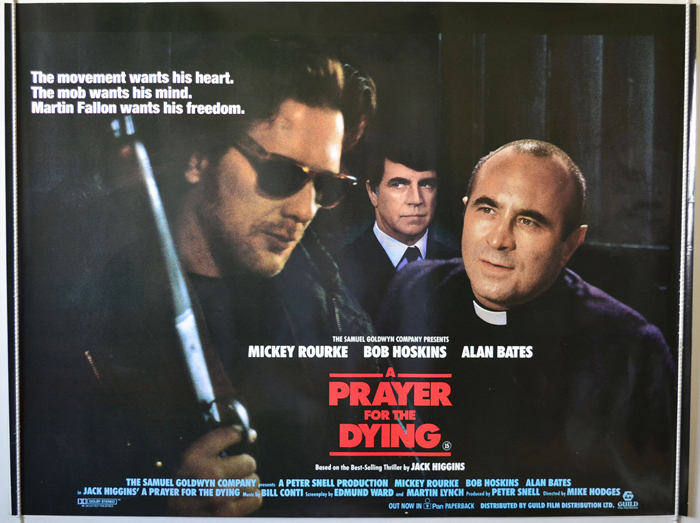 They were to film several scenes of clandestine meetings of the terrorists in a back-street Catholic church. The artistic director was quite happy with the flickering pricket stands and the statues. The following day, he said, he would get the florists in to do the flower displays … I interrupted, saying that this would be quite inappropriate and that we just needed four large rubber plants. He went up the wall, telling me that this was not what he wanted at all! What price historical accuracy? I suppose what gets me is the assumption that in the area of ‘religion’ it doesn’t matter, and that no-one will notice anyway. It’s not so much that the several million Christians in the UK will take to the streets at the sight of Tudor bishops eating their lunch wearing copes and baroque mitres. It’s that the media establishment just doesn’t know and doesn’t care that there is such a thing as the Church, and that millions of people belong and believe. They ‘don’t do religion’. And because of that their productions are not as good as they could (and should) be. But on the other hand they also produce moments of real hilarity for countless Christian viewers. Not that they ever meant to, of course. 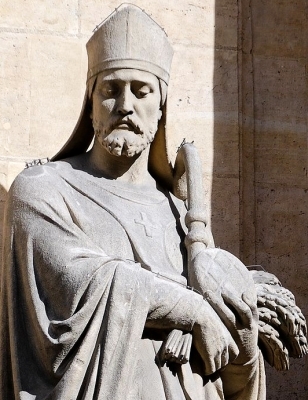 On the last Sunday of September the Diocese of Amiens in northern France celebrates in honour of its first Bishop, St Firmin, whose relics are kept in the cathedral (which is, I think, the largest Gothic cathedral in France). In the parishes Mass is celebrated on Saturday evening and the priests and people assemble in Amiens for Mass on Sunday afternoon. The Saturday evening Mass at Pont Remy gave us the opportunity to say farewell to Fr Bernard, who has been priest in our parish of Notre Dame des Etangs (the étangs are the ponds or pools which link the river along this part of the Somme valley) for the past eight years. I concelebrated the Mass with Fr Bernard and Fr Dominique-Marie (the parish priest of Abbeville), and at the end a tribute to Father was made by the mayor of Pont Remy, who spoke movingly of his care for the people of the parish. After Mass we gathered at the back of the church for a glass of wine and a slice of Gateau Battu, a type of Picard cake. 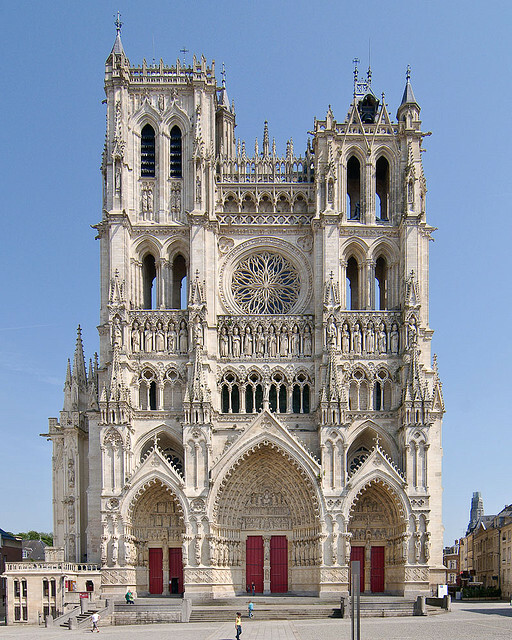 On Sunday – weatherwise a glorious day – the Bishop of Amiens concelebrated Mass in the Cathedral with his clergy and a congregation of about 1,000. From 10.30 in the morning there had been music, drama and dancing in the square at the west end of the Cathedral, and a shared lunch. The participation of the congregation was devout and enthusiastic, aided by the French custom of the ‘animateur’ who leads the singing indicating the notes to the people and where they should join in. I find though, that I miss the hymn singing tradition of the English. Most French liturgical music comes from the period after the Council, and there is a certain ‘sameness’ about it. I recall attending the Grande Messe at Notre Dame de Paris in 1969, when the Ordinary of the Mass was still the Latin de Angelis setting, once so well-known in France. A small choir in the west gallery sang the Gloria and the Creed alternate verses with the people. The mighty Cavaille-Coll organ shook the building as it accompanied the singing of the vast congregation. I wished we had heard more of the Amiens organ, and rather less of the electric piano. Still, it was quite an occasion and Mgr Leborgne presided and preached with his usual enthusiasm and verve.